Our Trustees’ report and accounts for the year ending 31 December 2015 are now available for download. An exhibition detailing the life and work of our founder, Jessie Boucherett, will be held at St Thomas Church, North Willingham near Market Rasen, Lincolnshire, between Saturday 23 July and Sunday 7 August 2016. Organised by the Lincolnshire branch of the Fawcett Society the exhibition is being held to commemorate its 150th Anniversary. The Society grew from the 1866 Committee that prepared a petition to Parliament asking for women to have the right to vote. It is today the UK’s leading Charity for women’s equality and rights, at home, in public and at work. 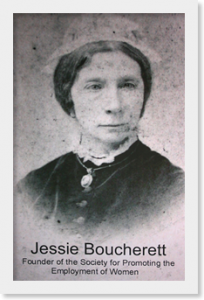 Jessie Boucherett was born in North Willingham and maintained links with the village, the nearby town of Market Rasen and the county, throughout her life. She is buried with other members of her family in St Thomas’s churchyard. The exhibition will cover Jessie’s life and work in various causes. Jessie continued to support the campaign for the vote, to ensure women were treated fairly in legislation and also to expand their employment opportunities and to provide practical training and other assistance to women from all parts of society. The exhibition is open between 10.00am – 4.00pm and tea and refreshments are available in nearby Willingham Fayre Tea Room.